I shared in my last blog about my family’s recent loss of our pet, Cooper, and how difficult that has been. We found a surprising source of comfort in Cooper’s last minutes with us and in the days since his passing. The folks at Rau Animal Hospital in suburban Philadelphia have shown us that customer service is not dead and is in fact alive and well at the practice. Making a print of our pet’s paws was another way the veterinarian practice showed exceptional customer service. For me, it’s the little things that office staff probably didn’t think about that made a lasting impact. It was the arm around my shoulder when I broke down. It was the nurse reaching for softer tissues for us to wipe away our tears. It was the vet asking if it was okay to have my 7-year-old daughter present before he spoke about our cat’s condition. And, even then, he did so with tact, delicately choosing his words. 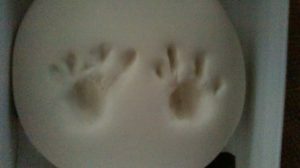 It was the vet tech imprinting Cooper’s paw prints in a piece of clay for us to have as a final tribute. The thing that really impressed us was the continued care and top-notch customer service even after Cooper was gone. My family appreciated receiving a sympathy card from the veterinarian. Within a week of Cooper’s passing, the veterinarian who had seen him sent us a handwritten sympathy card. I cried as I read it because it was so heartfelt and personal. 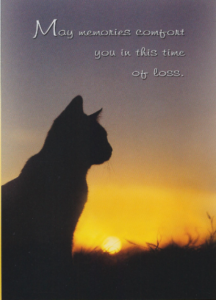 I’m sure the office has treated many pets who have died and could have just as easily sent out a generic condolence card. Yet, they took a few minutes more to write us a message about our beloved pet. At a time when big businesses reject every opportunity to provide customer service – sending customers with questions to forums or chat screens manned by robots – taking the extra step to make my family feel special meant the world to us. It also showed us that this is the vet practice that we want to take care of any pets we have in the future. Providing great customer service is the best – and under-used – way to market and grow your business. Companies spend gobs of money on fancy flashing billboards and digital advertising campaigns, but fail to take the time or make the effort to serve their customers. Make customers happy and they will sell your products and services through positive reviews and word-of-mouth advertising. What is your business doing to set itself apart and provide great customer service? Share in the comments section. Looking for ways to stand out among your competitors? Call Theresa for a free consultation at 215-519-8833.